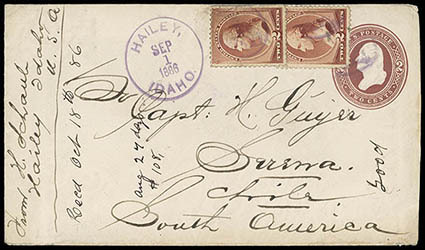 Hailey, Idaho, Sep 1, 1886, bold strike of purple cds duplex, the shield cancel ties two 2¢ red brown (210) singles on 2¢ red brown entire to Chile, reverse with New York (9.6), Coquimbo (10.17) and Serena (10.17) arrival cds; left stamp tear, a Very Fine use, ex-Willard on his exhibit page with hand-drawn map. 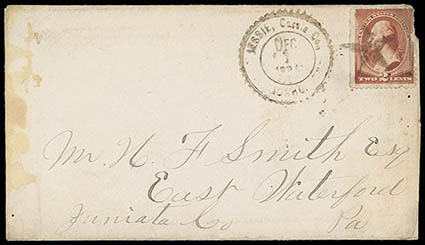 Jessie, Cassia Co., Idaho, Dec 1, 1884, brown serrated datestamp duplexed with fancy star ties 2¢ red brown (210) on cover to East Waterford Pa., Fine, ex-Willard on his exhibit page with hand-drawn map. 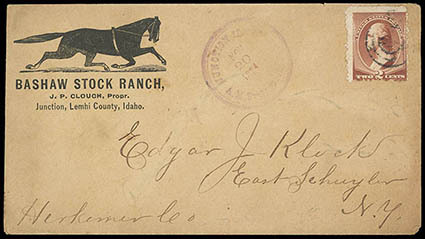 Junction, Idaho, Nov 20, 1884, purple cds on cover bearing 2¢ red brown (210) tied by target cancel on buff cover with Bashaw Stock Ranch illustrated ad cover showing horse to East Schuyler N.Y., F.-V.F., ex-Willard on his exhibit page with hand-drawn map. 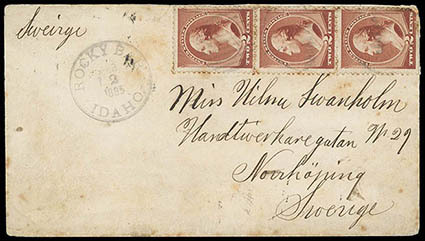 Rocky Bar, Idaho, Feb 2, 1885, cds on cover with match oval grid cancels tying 2¢ red brown (210) vertical strip of three to Sweden, reverse with New York (2.9) transit and Norrkoping (2.18) arrival backstamp, Fine, ex-Willard on his exhibit page with hand-drawn map. 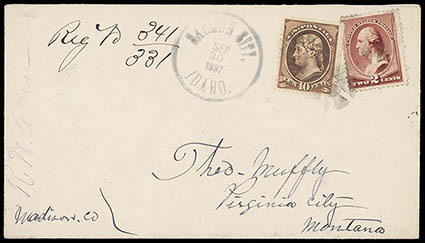 Idaho Territory, 1884-87, group of 5 comprising 1887 Salmon City registered with #210 and 209; 1887 Albion, Cassia Co. cds with honeycomb fancy cancel tying #210; 1884 Bruneau Valley with #210, 1887 Ketchum with #210, and 1886 Murray with #210, F.-V.F. group, each ex-Willard on his exhibit page with hand-drawn map.